I’ve received several messages that reported some trouble with the crayon washing out of (acrylic) felt when used with the ‘tinting fabric with crayon’ technique. I decided to post this tutorial after investigating the durability of the crayon colors in the felt I have been using. The first part of this is basically a repeat of the “tinting fabric with crayon” tutorial. I added it here so that you, the reader, would know the exact process prior to washing and blocking. All the steps of the experiment are documented. Hopefully, it will clear up any questions or differences that may produce differing results. Using acrylic felt, the inexpensive little rectangles sold at craft stores or stores like Wal-Mart, transfer the design to the felt. 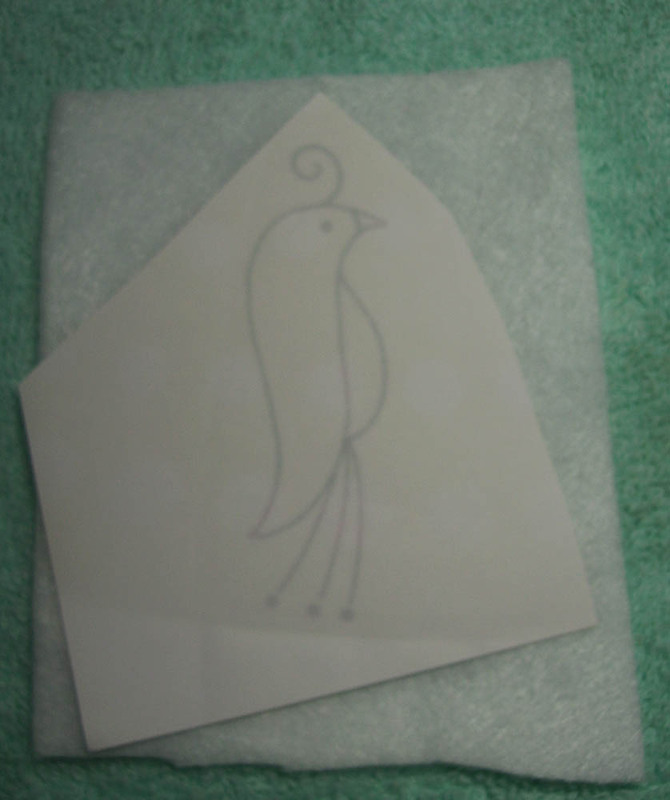 Here is a Iron On Transfer for a Bird from Jenny Hart’s Sublime Stitching Craft Pad. 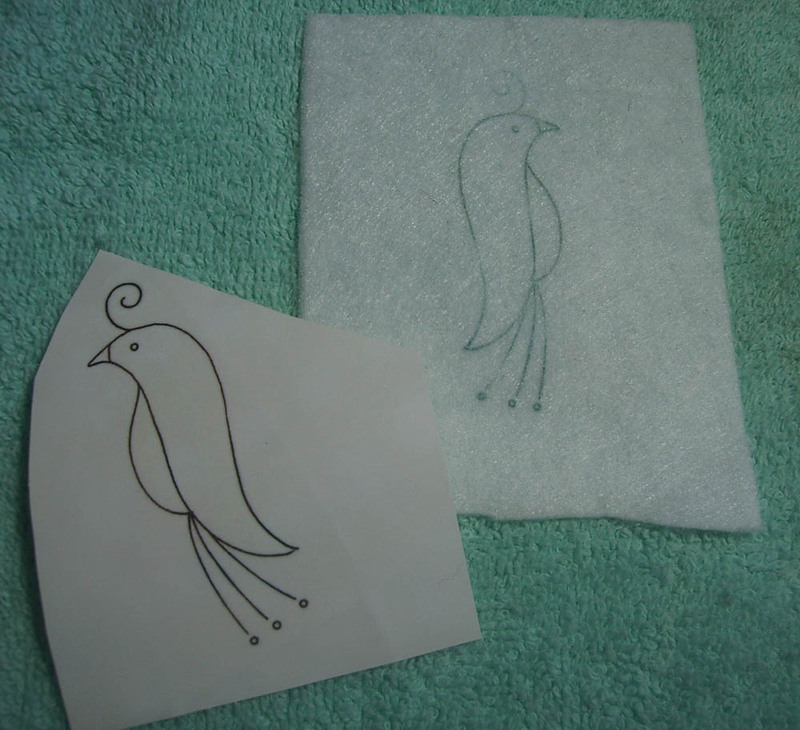 Cut out the transfer and the felt fabric you are wanting the design to transfer to. Position the transfer on the felt fabric. 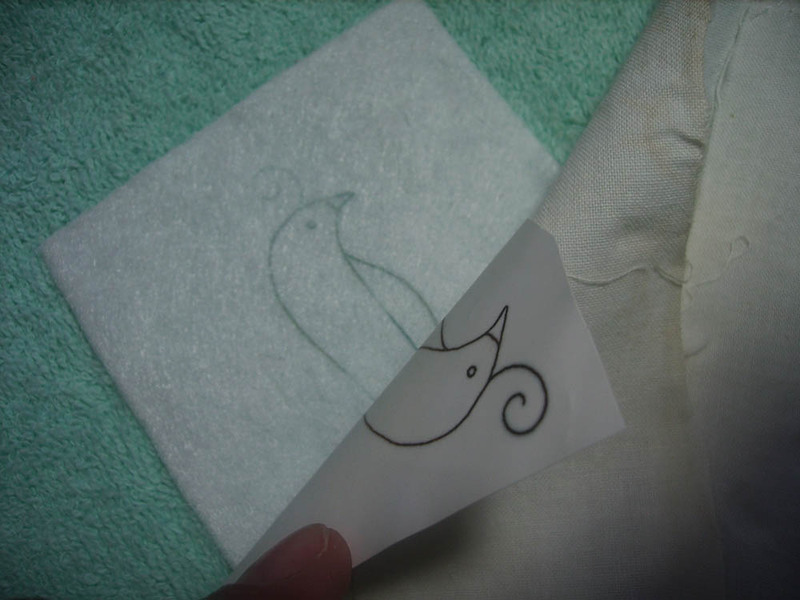 Once you decide where it is going, lift the transfer and touch the hot iron (cotton setting) to the felt for just a second. This will heat the fabric just slightly. Sometimes, this helps the pencil/pen to transfer darker. Only touch the iron for a short second. The felt may melt. Place the transfer back in place. 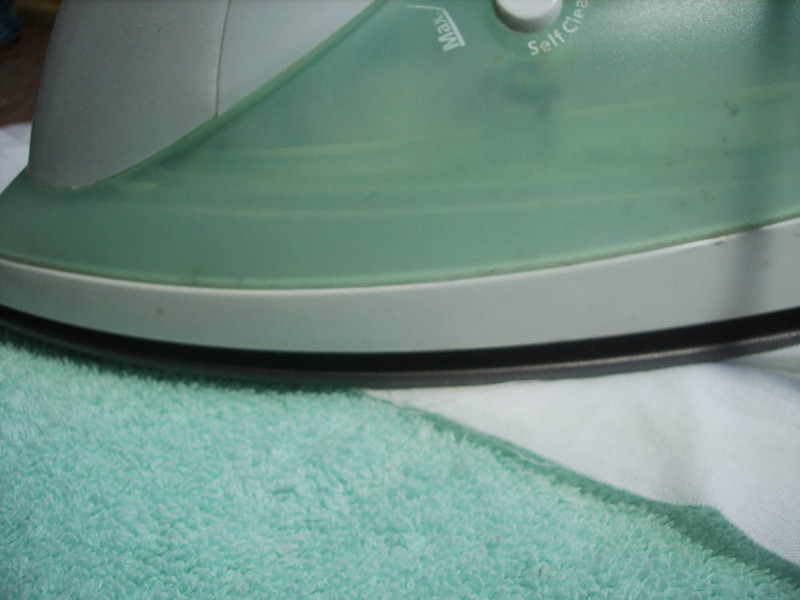 Cover any exposed fabric (see the edges above) with a light cotton or muslin to protect the felt fabric from melting onto the hot iron. Then set the iron down on the protective fabric. I usually let it sit there for maybe 30 seconds or so. (It’s long enough for me to take 3 or 4 pictures of the iron…lol) I don’t normally move the iron around. Sometimes, moving the iron around can cause the image to blur. Leaving the iron on the area, pull up a section of the transfer to “peek” at the progress. If you can see the image on the felt fabric, all is good and you can lift the iron completely. 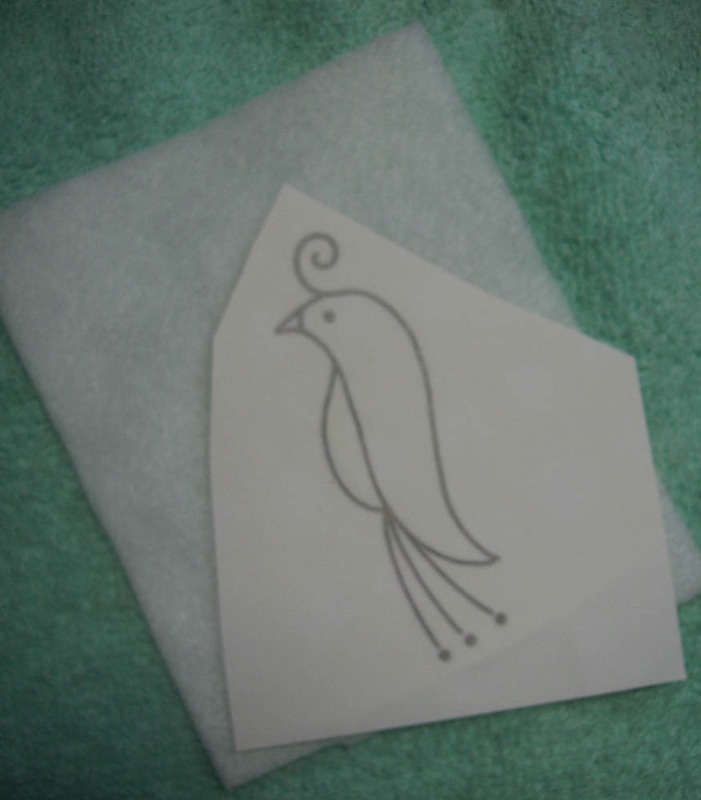 Here the image has transfered to the felt fabric. The lines are dark enough to guide coloring and stitching. Color the image with crayons. I have been searching for this very thing, how to transfer a picture on to fabric.